VANKLEEK HILL, ON – Beau’s All Natural Brewing has announced details for the fifth in its monthly series of collaborative beers being released as part of the brewery’s partnership with Ottawa 2017. Slideway is a 7% abv smoked lager created in collaboration with Side Launch Brewing, a pairing that allowed Beau’s brewmaster Matthew O’Hara and Side Launch brewmaster and co-founder Michael Hancock to revisit their time at Denison’s brewpub in Toronto, where O’Hara worked and trained under Hancock more than 20 years ago. Slideway pours copper with a white foam. The aroma offers a clean expression of beech wood smoke. The mouthfeel is full and velvety. Malt flavour supports the redolent-but-balanced smoke notes. Mid taste brings a touch of peppery spice. The finish is elegant and features mild lingering sweetness and savoury (yes, you guessed it) smoke. In addition to being part of the Beau’s Ottawa 2017 series, Slideway is also the official collaborative beer of the 2017 Canadian Brewing Awards & Conference (CABC), which will be taking place in Ottawa next month. 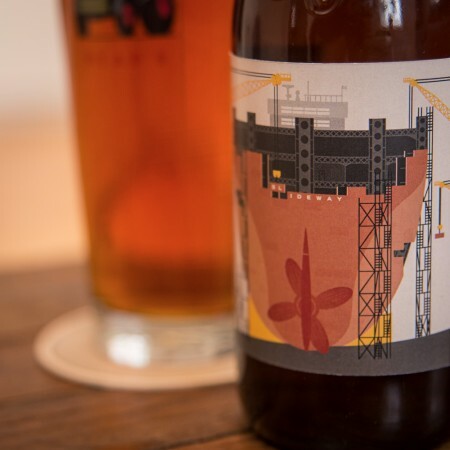 And as with all beers in the series, a portion of sales will be donated to a charity in the area of the guest brewery, with the recipient in this case being the Nottawasaga Lighthouse Preservation Society. Slidway will be officially released on Thursday April 27th, and will be available in 600 ml bottles at the Beau’s brewery store delivery service, and on tap at LCBO growler stations in Toronto (Summerhill) and Ottawa (Bank Street). It will also be pouring at joint Beau’s/Side Launch tap takeovers in Collingwood, Ottawa, and Toronto on May 5th, and at the CABC on May 25th to 27th.